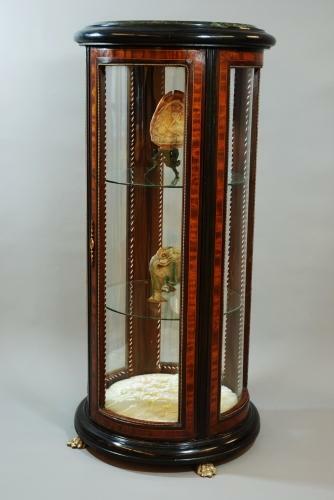 A late 19thc decorative glazed cylinder shaped display case in the form of a column with a marble top. The circular piece of green marble is inset into an ebonised wooden moulded top. The piece consists of four quarter sections, each section being a wooden frame with glass panels, all four forming a circle. The decorative frames consists of a brass ball bead around the glass, stained wood, boxwood stringing & mahogany cross banding. Between each of the four sections is an ebonised moulding, joining the piece together. The base is a moulded plinth, similar to the top section & the piece sits on four gilt brass, hairy paw feet. The interior consists of two circular glass shelves & on the base is a deep-buttoned upholstered cream cushion. This a very decorative piece, ideal for displaying treasued items. It is also a practical piece as does not take up too much room. The display case of stable construction & can go straight into a home.